There are a few times in my life that I can remember really enjoying strawberry jam. The first time was when I went to Le Cordon Bleu of Paris in Ottawa and I was living in a bed and breakfast while going to school. On a Saturday afternoon my host served tea. She brought out a quart size jar of the prettiest strawberry jam and spooned some of the jam into a bowl, then put the bowl in the middle of a tray of scones. It was a glorious moment when I took my first bite of home-made strawberry jam because I’d not tasted jam so fresh. I asked my hostess how she made it and she told me that it was freezer jam and gave me the recipe. It was nothing more than a pectin package that gave directions for freezer jam or cooked jam, but it was delicious. When I got home from LCB, I went to the store and bought a package of pectin, and strawberries and made my own jam. What an enjoyment to make the jam and then again when I ate it on my own scones with clotted cream. There is nothing like fresh strawberry jam. Nothing! Another time after LCB I was on my way back from a trip to England. We’d been flying for quite some time over the Atlantic and over ice if I remember. Fortunately, on that trip we were in first class and it was pretty quiet so I spent most of my time looking out the window at the ice below us. Miles and miles of ice, but the flight attendant broke the monotony when he announced that we were having tea and he was bringing a cart through with tea, scones, clotted cream and strawberry jam. What a wonderful place to have tea, 40,000 feet above the ocean. It was another great moment in time. I have strawberry plants now, but they have no berries yet so I might make my way down to one of the local strawberry farms and pick theirs. Mine will be ready soon and I’ll just make fresh jam again. Be forewarned that once you make your own jam you become very critical of jarred from the store, even though there are some very good brands out there. It’s so easy to make fresh that you’ll want to make it all the time anyway, instead of buying it. Prepare your canning equipment first by following the manufacturer’s instructions. Sterilize jars and lids according to the manufacturer’s directions. 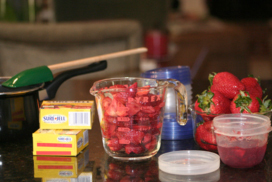 Prepare 5 cups of crushed strawberries (crush 1 cup at a time) Use exact amounts. 1 small box fruit pectin such as Sure-Jell or Certo. Add crushed berries to a 6-8 quart heavy saucepan. Measure exact amount of sugar into a separate bowl and set aside. Stir in one box of pectin per pectin package instructions. Add ½ teaspoon butter to the pan if you want to reduce the foaming. Bring to a boil on high heat, stirring constantly. Immediately add the sugar all at once. Return to a full rolling boil and boil for 1 minute, stirring constantly. Set your timer when it has become a full rolling boil so that you don’t overcook. Skim off any foam. Ladle into clean jars filling to within 1/8-inch of the top. Clean off any spills with a clean cloth. Cover with 2 piece lids. Screw bands tightly. Follow canning instructions. Yield: about 8 cups. Use any container for this recipe as long as the container has been washed and dried and is perfectly clean. In a large bowl, mix berries and sugar and let stand for 10 minutes, stirring occasionally. Stir in 1 box of pectin and ¾ cup water in a saucepan. The directions say that the pectin may start out lumpy. Bring to a boil on high heat, stirring constantly. Boil 1 minute, stirring constantly. Remove from heat. Stir pectin mixture into fruit. Stir constantly until sugar is completely dissolved. Pour into prepared containers, leaving a ½ inch head space. Cover. The directions say to let stand at room temp for 24 hours but I believe that I would refrigerate after it cools and then freeze. This will keep for 1 year if frozen. Most importantly follow any manufacturer’s directions on canning to keep from becoming ill from contaminated food or food that has not been processed properly. Also, follow the directions of the fruit pectin maker to insure that your jam sets as it should and it does not become contaminated. The directions above are abbreviated, but you will find the entire set of directions for both cooked and freezer jam in the pectin package. Combine all ingredients in a small bowl and beat with a mixer until fluffy. Serve with your favorite scones and jam.